Thank you for visiting our website and considering us for your lodge, wilderness, big game hunting, fly-fishing, pack-trip or shooting school experience. Your foremost choice of outfitter and guides for fair chase, free range, Wyoming and Oklahoma big game and trophy species. We provide you with an unmatched opportunity for your general hunting needs while you build Preference Points! Each year, we make many new friends! Groups come into our camp as clients, then they leave as friends, having formed a special relationship that hunting together allows. As a result, we receive many positive comments about Best of the West Outfitters. If you’re looking for a trip into the past where the wild life is untouched and scenery is as beautiful as it was 1000 years ago then this is the place to be. If you’re looking to catch trophy cutthroat trout in the only place in the world you can find them stacked up awaiting your arrival then this is the place. If you enjoy riding rather than packing and love good company and great food around the camp fire then this is the place. Worth every penny Bruce and his team truly are the real thing and this truly is a genuine experience. I highly recommend this trip for the fishing enthusiast, the horse enthusiast and the nature enthusiast. Two thumbs way up to Bruce and his team. Great job! My Hunt was for Wyoming bull elk in a National Forest camp. Bruce picked us up at the airport and he drove us to his lodge. After a great breakfast we hit the trail on mules hunting for elk. We choose to hunt with calls and decoys during archery season. We had never hunted elk with mules before, so we gave it a try. After about a half hour we ran into a nice herd of elk. We harvested a big 6×6 bull elk. 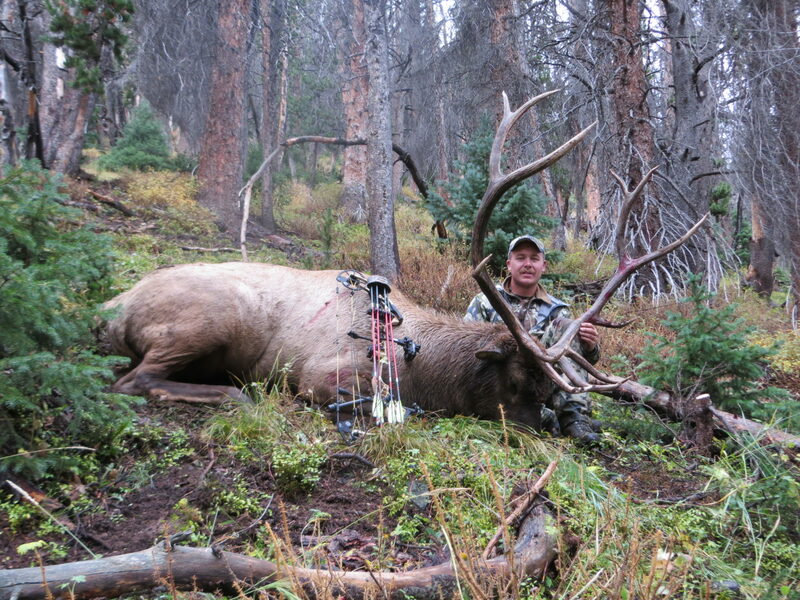 Archery elk using calls and decoys are fun and exciting to hunt with. What a rush! We ended up with 4 bulls and great meals everyday. I will definitely do it again!!! Having experienced all there is with outfitters from good to bad, Best of the West is definitely top notch. From the first conversation Bruce and his staff make you feel welcome and at home. The staff spent 12-14 hour days making sure all my needs were met and that my hunt would be memorable. Even though I did not harvest an elk like I was hoping, they did everything and then some to try to make it happen. Even with out punching my tag this was one of my most enjoyable and exciting hunts I’ve been on. I highly recommend them and will be booking for 2017. My son and I hunted a camp hunt with Bruce in 2014 the area we hunted had lot’s of elk and we both harvested nice archery bulls. Hunts like this are what memories are made of. We enjoyed ourselves beyond compare. Best of the West Outfitters (BOTWO) provides a variety of tent hunting camps for elk and mule deer throughout west central Wyoming. On occasion BOTWO will have access to camps in northern Wyoming. These camps range from a drive-in camp where you can unload your gear from your pickup within a few feet of the tents to the typical campsite where access occurs via a horse or mule ride from a trail head a few hours away. In either case, the camps are designed to provide the ultimate wilderness hunting experience whether you are on a once in a lifetime hunt or a repeat hunter in the wilderness areas of the Rocky Mountains in Wyoming. The South Piney camp is about 35 miles west of Big Piney, WY., and it provides hunting access to all of Unit 94. Because it is the drive-in camp, it is easy to load horses and mules into trailers in the predawn and transport them to the north end of the hunting area. In 2017 this occurred on two separate days during one hunting season and generated success for a different hunter each time. Clearly this was a unique opportunity for those hunters. Other hunters were successful within 1-2 hour direct horseback rides from the camp. In all cases, different herds of elk provided opportunities for all of the hunters. In 2017, 36 rifle hunters for elk were successful out of 36 hunters who accepted the challenge. Of the 5 archery elk hunters, 3 were successful. Although this success rate may not happen every year, the staff of BOTWO will make every attempt to provide any hunter with the opportunity for success. The camps are set up with wall tents for the hunters, guides, in-camp staff, and a cooking/meal tent. An important feature of all of the camps is that the horses and mules are owned by BOTWO. Further, the guides and camp staff have worked with Bruce for several years. In addition, the guides grew up on ranches, have extensive guiding experience, and many have rodeo experience which is valuable when dealing with the horses and mules. This background will provide any hunter, regardless of horseback or wilderness hunting experience, with the assurance that your hunt will be provided in the most efficient, safe, and enjoyable manner. Whenever you wish to hunt, BOTWO will provide an ultimate hunting experience for you. Although hunting does not come with promises of fulfillment, you will enjoy the experience of hunting with Bruce at Best of the West Outfitters. If you want a great horseback hunt with quality horses/mules “Best of the West Outfitters” is the place to go. Bruce’s guides are top notch and also top notch cowboys who often frequent the rodeo circuit. This is a great plus in coaching us flatlanders on what we need to know about horsemanship. Best of the West camps are in great condition with quality wall tents and cots. The cook tent is spacious and the food is plentiful and great tasting. The wranglers had our beasts of burden ready to go when the time came. The guides knew the area and where to set up for glassing to locate the elk. Bruce provides a variety of camps from camps that you can drive to the tent, to wilderness camps where you can get used to the saddle on your way in. The guides put us on elk every day, then the shooting decisions were on us. We were asked about our shooting abilities so the guides knew what we were comfortable with. I have already scheduled my next hunt with Bruce. Schedule yours today! I was able to experience the hunt of a lifetime this last week. We rode many miles horse back in the Western Wyoming hunting for elk.That area is some amazing country. On October 12th we found this huge bull laying in his bed. We set up on a high ridge and was able to harvest him at 240 yards. It turned out he had about 30 cows with him and had been busy this fall. I could of never been able to have had the dream become a reality with out the help of a great friend and professional guide Blaine Mathews. Miss Piper and our good friends at Best of The West Outfitters where instrumental in the success. If you are ready for western adventure in some of the finest country in North America look them up today! Hunting with Bruce Lindsey at Best of The West Outfitters has delivered many great experiences. The morning brings high hope and anticipations, the day brings excitement and stalking into place for the shot and the evening brings comradery, laughter and great stories. We hunt with Best of the West every year! Great Guides Top notch staff, Unbelievable country… If you are looking for a back country Hunt with the chance to Kill a Bull of a lifetime, this is your destination! I Killed my Bull of a Lifetime with Best of the West! I had a Helluva great hunt in 2017 and enjoyed everyone that made our visit so enjoyable!! Can’t wait till next season!!! Was an awesome (5) day hunt! Bruce has top notch horses & mules & equipment, the guides were awesome people to hunt with , top notch camp cook , the food was five stars, just awesome trip!!! Best of the West Outfitters is the real deal! Unbelievable trip of a lifetime! The country is absolutely amazing as is Bruce and his staff. I highly recommend them for any western adventure! Top notch guides and professionalism! Don’t look any further than Best of the West, it’s all here! I just had the most unbelievable trip ever! I can’t put it into words. Too many pics and stories for FB! Here’s my 6×6! Just got out of the mountains tonight. I’m speechless. Try Best of the West Outfitters! 5 Stars! I can’t resist! Group picture. Thank you Best of the West Outfitters and everyone involved in this lifetime dream of mine! What a great bunch of guys! Special thanks to Eric Mittlestadt for putting this dream hunt together! Great environment, good food, competent hard working guides. They treat you like they care. We had a great hunt and still didn’t score!! Had 3 good bulls at 400 yards, just wasn’t up to the task. No ones fault except too old and to out of shape to be prepared. Loved the whole time. I highly recommend you let Bruce and his guides treat you to the hunt of a lifetime. The Hunt of a Lifetime! Best of the West Outfitters ! If you are looking for the hunt of a lifetime. You have come to the right place! Over the years I have talked to numerous hunters that had always dreamed of a horse back Elk hunt out west , staying in wall tents and eating from cast iron pans . Everyone is looking for “The Real McCoy”. Best of the West Outfitters is exactly what you have been looking for ! Best of the West Outfitters are true professionals and have seasoned guides and staff that have a true passion for hospitality as well as hunting trophy game. Best of the West Outfitters has horses and mules that are sturdy, gentle and friendly for beginners as well as seasoned riders. When I tell folks about Best of the West Outfitters and the great time we had on our trip the first thing they ask is was it on private ranch? I say nope,it was on public land. That is a testament of what true professionals can deliver! If you are ready for true adventure in some of the finest country in North America , call Best of the West Outfitters and reserve your spot today. Got to give a shout out to Best of the West Outfitters for a great 2 weeks up in the mountains. Great guides, great cooks, and great wranglers made for an awesome back country elk hunt. If anyone is looking for an awesome experience in the mountains in Wyoming go check these guys out whether it’s elk or mule deer hunting or fishing, they can fix you up! I’d give 10 stars if I could! Best of the West Outfitters offers the adventure of a lifetime. Bruce is a top-notch guide, stock-man and cowboy! An absolute top hand! They also offer customized long-range rifles. Check out their Facebook page. They are the best way to experience the Tetons. What an amazing trip!! Bruce & all the guys are class acts, I highly recommend! It was awesome (5) day mule deer hunt in the mountains. The camp was top notch will organized and set up , very comfortable accommodations . All the equipment & all the horse & mules were top notch . All the guides , wrangler , camp-jack & cooks that work for Best of the West outfitters r top notch . It was an awesome experience . If you get the opportunity to hunt with Them it will be well worth it. They also make an awesome custom gun. Can make whatever caliber you won’t . I’m a well satisfied client. For More Information on the Big Game Hunting, Fly Fishing or Summer Pack Trip of Choice, Call or Email Best of the West Outfitters Today! 366 East Green River Rd.